Russ and I attended the same router course last year and since then he’s been using his new skills to build gaming chairs. One of the challenges for this was to fitting the nuts into the boards so that they would not stick out. 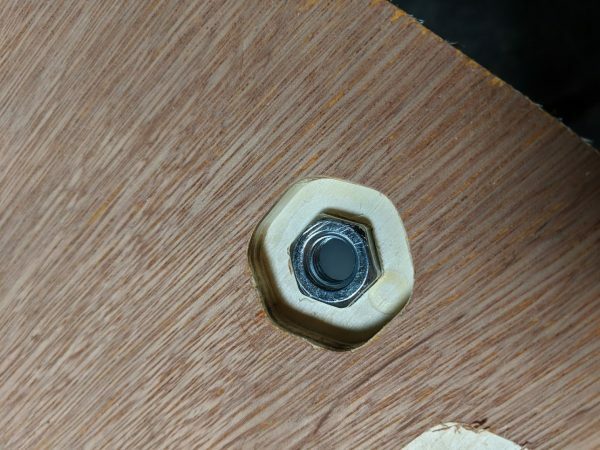 Russ: I recently had a requirement to make a hexagonal indentation in a panel to hold a captive nut, and found a simple and accurate way to do this with a router and some scrap wood. Some scrap material – 9mm MDF is fine, I used ply. This method will work for any size of bolt, but bigger sizes will work better as the router will round off the corners slightly. Drill a hole in a piece of scrap the right size for your bolt. Insert the bolt and tighten so that it will not revolve freely. Setup the router with 20mm guide bush and 6mm cutter.We’re going to cut around the bolt with the guide bush. 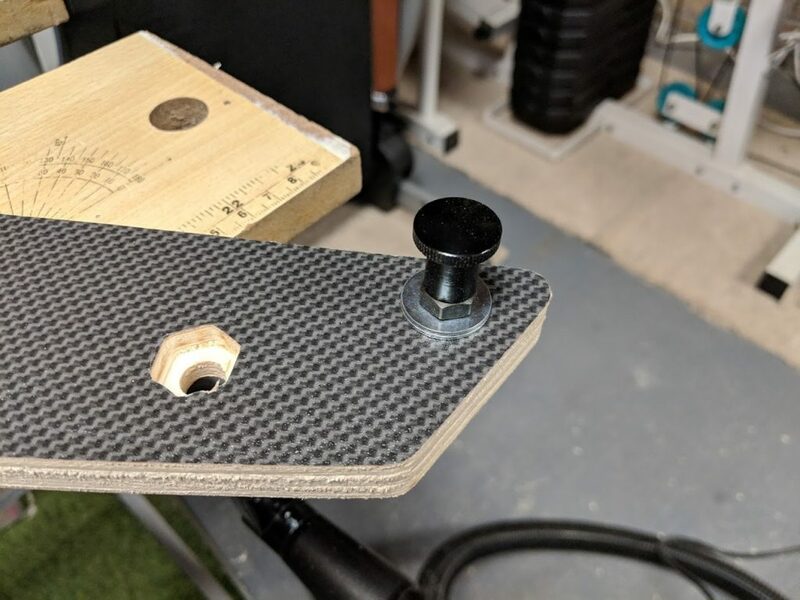 To prevent the router from wobbling, arrange some scrap that is slightly thicker than the protruding bolt to support it. 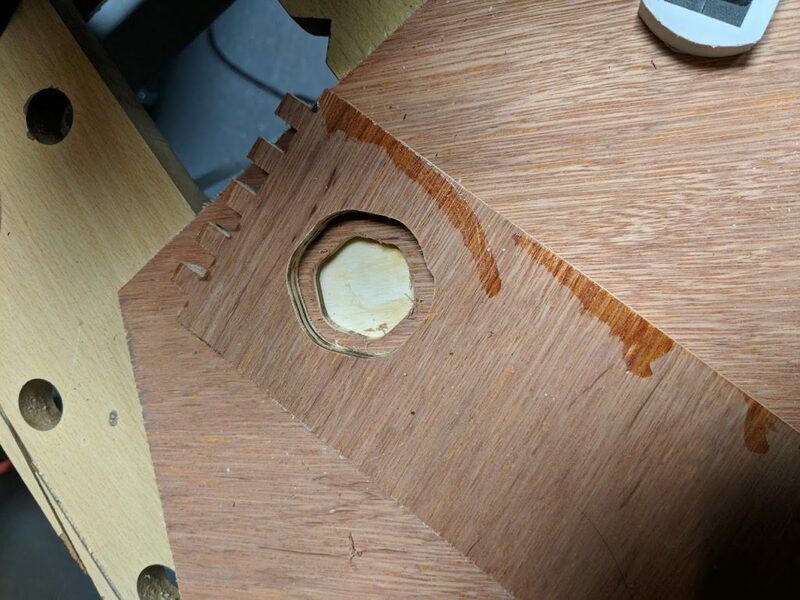 I had some scrap from an earlier circle cut that did the job perfectly, but you could simply stick some small pieces to the corners of the router base. The photo below shows everything setup before the first cut. This gives you a hexagonal hole that has a radius 13mm bigger than we want. Lightly sand the hole to widen it a little. You can return to this step if the template is too tight to accept your bolt. Change to the 8mm cutter. Stick your new template to a fresh piece of scrap. Set the plunge stop on your router to cut the scrap slightly deeper than the flange on your guide bush. Cut around the template and remove the centre to make a shallow hexagonal indent in this second template. This will have a radius 7mm bigger than we want. Step 4. Remove your outer template. Change back to the 6mm cutter. Cut around the outer edge of this new hexagonal indent, this time going all the way through the material. 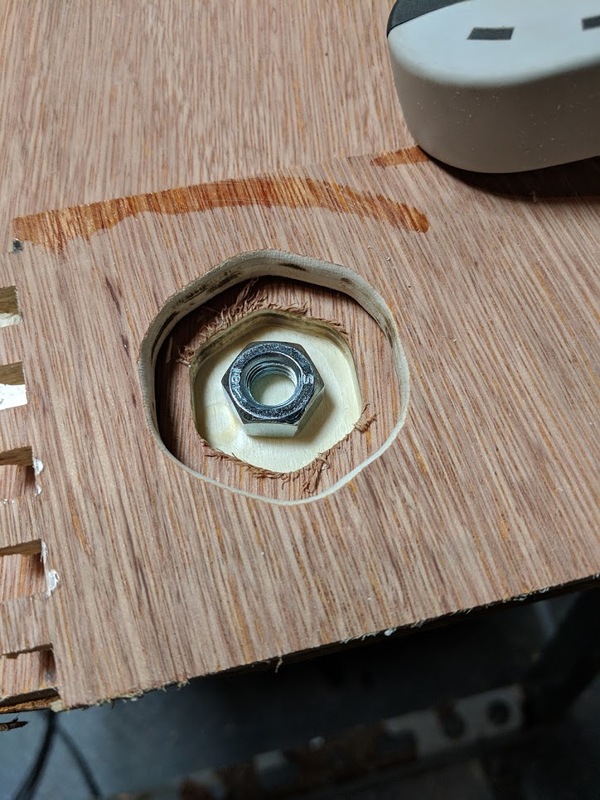 You should find the resulting hole perfectly accepts your nut/bolt. If not, return to step 2 for some more sanding. Otherwise, you are ready to cut your workpiece. Drill the hole for your bolt through the workpiece. 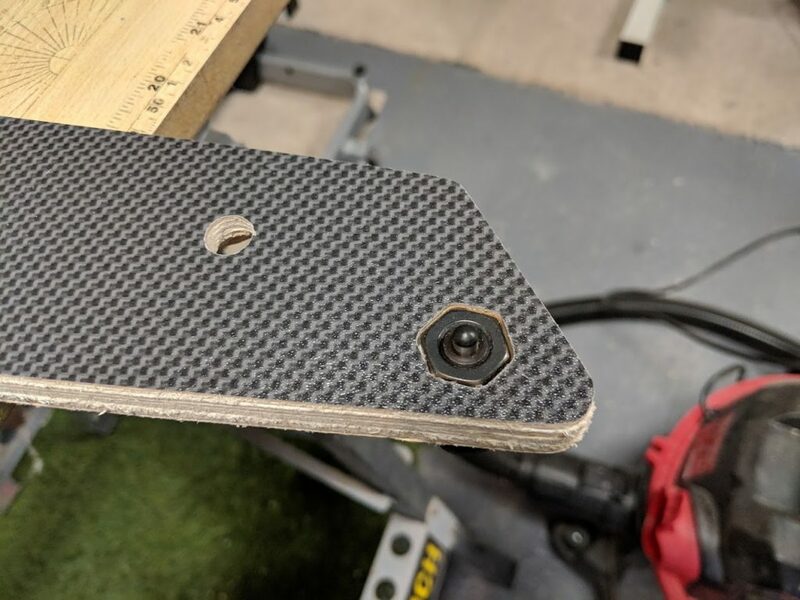 Put the bolt in place, and use this to locate the template perfectly over the hole. Clamp in place, then remove the bolt.Set the plunge on the router so that the cutter just touches the workpiece. Place the bolt head in the plunge stop and set it, then remove the bolt head – now the cutter will cut exactly the right depth. Build logs for the gaming chair. Russ likes to play Elite:Dangerous in a small home office, using throttle and stick controls. 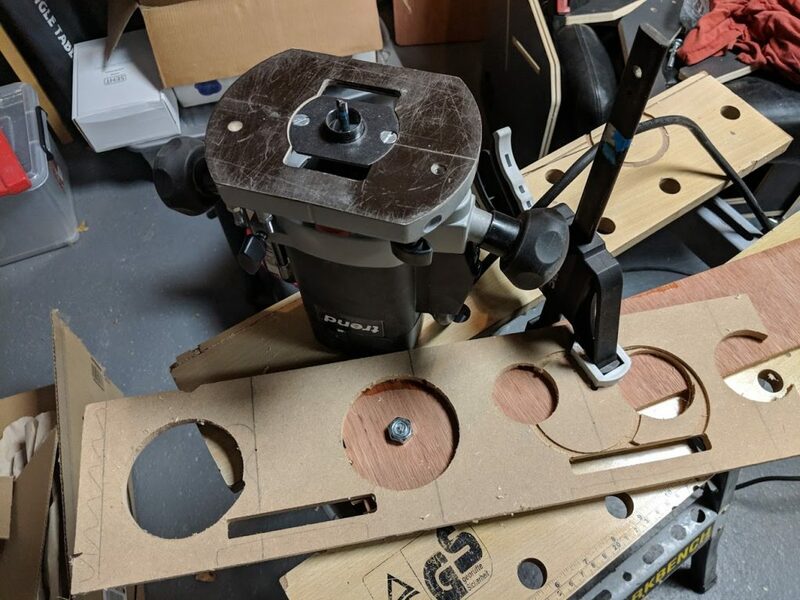 The search for a practical, ergonomic, and aesthetic solution for arranging the controls led to him making 3 increasingly sophisitcated gaming chairs, revealing a passion for woodworking. His latest design has folding arms that take inspiration from eliptical cutting jigs that use perpendicular slides to cut perfect oval shapes with a router. In the past year he’s spent more time making sawdust than flying his virtual spaceship, and makes no apology for this.